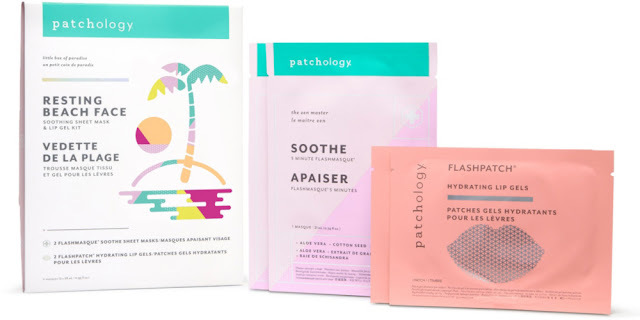 Give post-sun skin a treat with: Patchology Resting Beach Face Soothing Sheet Mask & Lip Gel Kit - $20 - a sheet mask and lip gel duo designed to soothe, hydrate and renew beach-slapped skin. 2 FlashMasque Soothe Sheet Masks - created with the best ingredients from mother Nature's medicine cabinet, this masque is your 5-minute remedy. With aloe vera and cotton seed extract - natural anti-inflammatories that help soothe and calm redness; schisandra berry - de-stresses skin and improves moisture for a plump, youthful glow; and a blend of rosemary, sage and lavender - bursting with vitamins, minerals and antioxidants to help repair irritated skin. 2 FlashPatch Hydrating Lip Gels - quickly moisturizes dry lips and preps your pout for that favorite lip product. Each 5-minute biodegradable lip mask provides essential hydration and delivers ingredients like peptides to improve elasticity, green tea to soothe and niacinamide to prevent skin from losing water.